Experience the wonder and beauty of a Bryce Canyon vacation. Bryce Canyon is one of natures most unique rock landscapes and is a must to see during your Southwest vacation. See Zion National Park, then head to Red Canyon and of course, Bryce Canyon. Make sure to also visit Cedar Mountain, Cedar Breaks and the Grand Staircase. Drive to Scenic Byway 12, the All American Highway, where you will drive through Dixie National Forest's Red Canyon on the way to Bryce Canyon. This is a wonderful recreation area inside the forest boundaries. Many travelers think they are in Bryce Canyon when they drive through the red rock arch, because the hoodoos are so similar. This is a 47-mile drive from the junction of Highways 9 & 89, located on the east side of Zion National Park. If you have biking, horse trails or OHV fun on your check list, then you will want to spend some time at Red Canyon. There is also hiking trails for those who prefer to foot it. After spending some time in Red Canyon, drive along Scenic Byway 12 for 9 more miles, to Bryce Canyon National Park. A good place to begin your adventure in Bryce Canyon is by walking along the rim. The rim trail is 11 miles, traversing the edge of the hoodoos from Fairyland Point to Bryce Point. Looking down into the amphitheaters. you will see fairy tale-like rock sculptures, called hoodoos. Most of the trails in Bryce Canyon intertwine, connecting somewhere along the trail. Suggested hiking trails in Bryce Canyon are the Navajo Loop and Queens Garden Trail. If you have a family with you or you would like something different from most of the trails in Bryce Canyon, try the Mossy Cave Trail. This path leads to a unique desert waterfall and a small mossy alcove in the side of a cliff. This trail, out of the main amphitheater, is less traveled than most of the trails in Bryce Canyon. Later in the day when you are ready for a rest, Bryce Canyon offers a scenic drive with many views points. Make sure to stop at the highest of all the peaks, Rainbow Point (9,100 ft.). Natural Bridge is another stop you will not want to miss. Of course no trip to Bryce Canyon is complete without observing the view from Sunset and Sunrise Points. 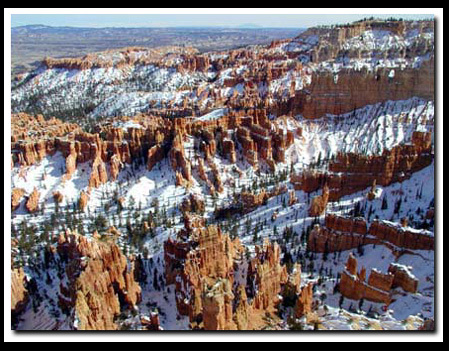 While in Bryce Canyon look for the following points of interest: Thor's Hammer, The Hunter, Paria View and Queen Victoria. At the end of your day return to East Zion for a restful night before getting ready for day 3 of the spectacular "Canyon Country" Vacation Tour. Queens Garden Trail: 1.6 mile round-trip. This short trail is considered to be the least difficult trail into the "canyon". Begin at Sunrise Point and descend below the rim. The trail does not loop, but there is the option to combine with Navajo Loop. The uphill climb on the return is steep. This trail can be hiked in reverse going downhill on the steep section at the start. Mossy Cave is an easy hike that is fun for families. It leads to a desert waterfall of jagged rocks and a small alcove. The trailhead is located just past the main entrance into Bryce Canyon. Fairyland Loop Trail: 8.5 mile round-trip. Begin this strenuous hike at Fairyland Point or north of Sunrise Point. The Fairyland Loop Trail descends more than 900 ft., joining the Rim Trail to make a loop. This is a great hike to take to see a variety of hoodoo formations. Under the Rim Trail: 23 mile round-trip. This is a moderately strenuous and remote backpack . Begin the hike at the Bryce Point Overlook. A permit is needed for overnight hikes in Bryce Canyon. Bryce Canyon is located a quick 60 miles from the junction of Scenic Byways 9 & 89 on the east side of Zion National Park. The Prickly Pear cactus is a common site in Bryce Canyon. This is not something unique to Bryce, in fact this cactus is found in every state in the United States with the exception of Maine, Vermont and New Hampshire. Several products are made from the fruit of the Prickly Pear Cactus. These include jelly, cactus syrup and cactus honey. All parts of the cactus are edible.